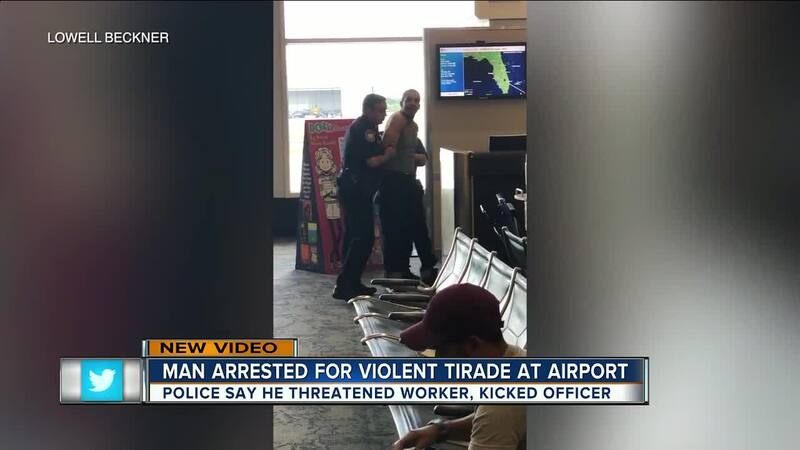 TAMPA, Fla. — An unruly traveler was arrested after causing a ruckus at Tampa International Airport on Wednesday because he was upset about a delayed flight, officials say. The incident took place around 2 p.m. ET in Terminal A outside gate A-12. 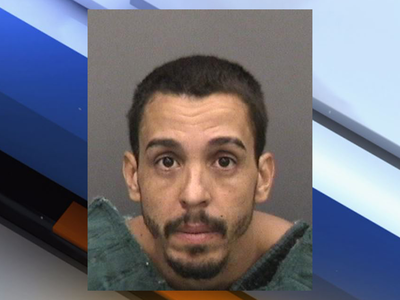 According to Tampa International Airport officials, the male traveler, identified as Ralph Rodriguez-Hernandez, 36, was waiting to board a Jet Blue flight to San Juan when he became upset because his plane was delayed. Officials say the traveler threatened to kill the ticket agent at the gate. 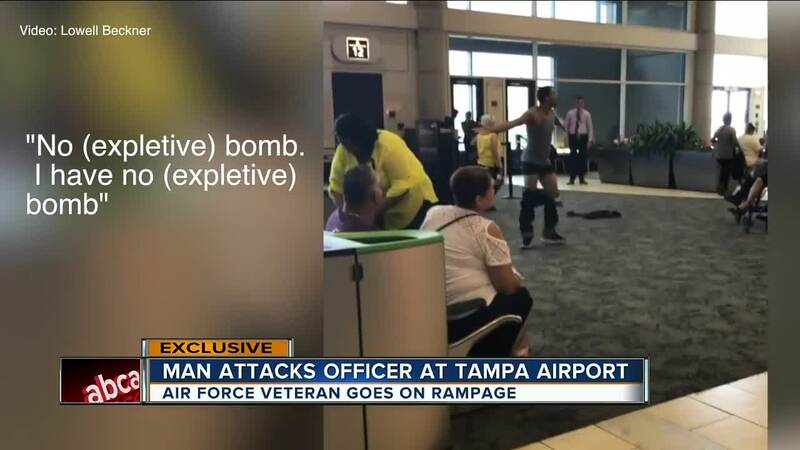 Video captured of the incident shows the man remove his pants as he yells, "No f****** bomb. I have no f****** bomb." The traveler took a seat in the waiting area for his gate when TIA police officers responded to the situation. 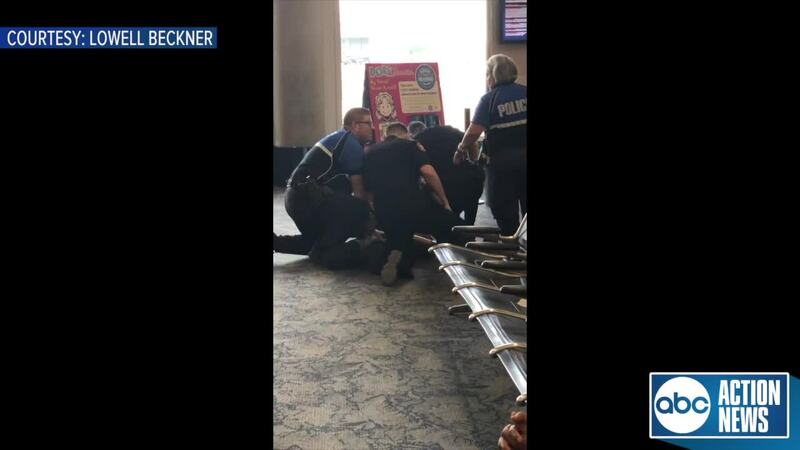 That's when TIA officials say that the traveler became agitated and violent. The video shows that while being taken into custody, the traveler kicked an arresting officer in the face. "He completely changed like you see his eyes he is not there he is just constantly full alert," Rodriguez-Hernandez's wife, Carmen Rodriguez said. She says her husband suffers post-traumatic stress disorder. "What happened in the airport, I feel sorry, I really am I apologize but I know he didn’t mean to do it he is going through a lot of things," Rodriguez said. "He is having trouble adjusting to civilian life." Rodriguez said her husband was deployed six times over the course of 15 years serving in the Air Force. Recently, she says her husband had threatened suicide. "I wish people can understand more what veterans go through I wish they had a little more understanding it’s not easy for them to be out there," Rodriguez said. "I can feel it in his eyes, what he feels every time he is triggered. And, it’s painful for him. And it’s painful for me. And, it’s not easy for them at all and I feel so much pain what they went through." Officials say that the dog that was with the traveler, a rottweiler mix, is in the custody of police as well. Rodriguez-Hernandez faces charges of disorderly conduct and battery on a law enforcement officer, according to TIA.